A great time for a great cause! 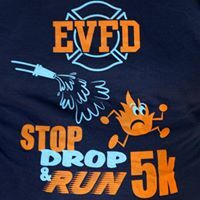 Come out and celebrate our 3rd running of the Easton Volunteer Fire Department’s Stop, Drop and Run 5k run and 1 mile walk, on Saturday, April 1st, 2017. The fun starts at NOON at the Easton Volunteer Fire Department. Registration and packet pickup starts at 10am!! Your entry fees cover your race (5k walk/run or 1 mile walk), a BBQ lunch and 2 beers (for those participants above 21 – ID REQUIRED). All of the proceeds go back to the Easton Volunteer Fire Department!! There will be prizes for the top overall male and female, top male and female under 15 years old and top male and female OVER 15 years old. There are also special prizes for our local First Responders, so let your Fire/EMS/Law Enforcement friends know!! Who will have bragging rights for 2017?